Is your Dog A Food Gulper? You put your dog’s dinner out and within one second it’s gone! I’m sure your dog isn’t savoring every bite. There are some tools that can slow him down a bit although I don’t agree with the use of all of these tools, some may be helpful. Here are tips published by The Honest kitchen. Make your own decision but I tell you I like the last suggestion best. 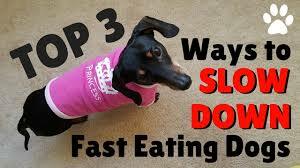 If, when given his food, your dog eats as if it’s his last meal, you’ll want to slow him down a bit. Not only is the dog who gulps his meal unsatisfied (his stomach hasn’t yet told his brain that he’s full) but many gulpers will vomit after eating because they’ve shocked their stomach by taking in too much food too quickly. Some dog owners will place some smooth stones that are too large for the dog to swallow in with the dog’s food so that as he’s eating, the dog will have to move the stones around in the bowl to get to the food. There are also commercially available bowls with pillars that come up from the bottom of the bowl that serve the same purpose. There are many food dispensing toys on the market now that can be loaded with your dog’s meal (or treats) and with these, he has to move or otherwise manipulate the toy to get his food. These range from simple (for puppies) to more advanced. You can also slow down a gulper by feeding him half or more of his meal by hand. When you’ve fed him at least half of his food, asking him to sit while he eats and asking him to take it gently, then give him the rest of his food. Edgewater Gold Radio is playing the best oldies all the time! Join us for oldies variety. Ask Alexa to “Play Edgewater Gold Radio.” Listen from our website, Edgewater Gold Radio.com. The best oldies on the best station! This entry was posted on Sunday, February 10th, 2019 at 10:23 am	and is filed under Pet Supplies. You can follow any responses to this entry through the RSS 2.0 feed. Both comments and pings are currently closed.